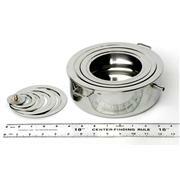 This standard size (8" x 2.75") water bath is ideal for heating flasks, bottles, tubes, etc. Features seven concentric rings, flat bottom, and a steam escape outlet. Stainless steel construction.